Dec. 2, 2010: NASA-supported researchers have discovered the first known microorganism on Earth able to thrive and reproduce using the toxic chemical arsenic. 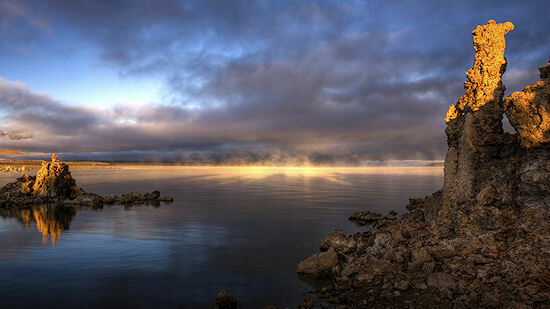 The microorganism, which lives in California's Mono Lake, substitutes arsenic for phosphorus in the backbone of its DNA and other cellular components. 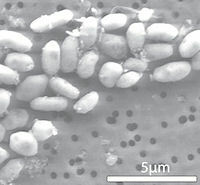 A microscopic image of GFAJ-1 grown on arsenic. This finding of an alternative biochemistry makeup will alter biology textbooks and expand the scope of the search for life beyond Earth. The research is published in this week's edition of Science Express. "We know that some microbes can breathe arsenic, but what we've found is a microbe doing something new -- building parts of itself out of arsenic," said Felisa Wolfe-Simon, a NASA Astrobiology Research Fellow in residence at the U.S. Geological Survey in Menlo Park, Calif., and the research team's lead scientist. "If something here on Earth can do something so unexpected, what else can life do that we haven't seen yet?" The key issue the researchers investigated was when the microbe was grown on arsenic did the arsenic actually became incorporated into the organisms' vital biochemical machinery, such as DNA, proteins and the cell membranes. A variety of sophisticated laboratory techniques was used to determine where the arsenic was incorporated. 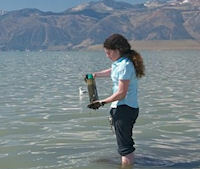 The team chose to explore Mono Lake because of its unusual chemistry, especially its high salinity, high alkalinity, and high levels of arsenic. This chemistry is in part a result of Mono Lake's isolation from its sources of fresh water for 50 years. The results of this study will inform ongoing research in many areas, including the study of Earth's evolution, organic chemistry, biogeochemical cycles, disease mitigation and Earth system research. These findings also will open up new frontiers in microbiology and other areas of research. "The idea of alternative biochemistries for life is common in science fiction," said Carl Pilcher, director of the NASA Astrobiology Institute at the agency's Ames Research Center in Moffett Field, Calif. "Until now a life form using arsenic as a building block was only theoretical, but now we know such life exists in Mono Lake." The research team included scientists from the U.S. Geological Survey, Arizona State University in Tempe, Ariz., Lawrence Livermore National Laboratory in Livermore, Calif., Duquesne University in Pittsburgh, Penn., and the Stanford Synchroton Radiation Lightsource in Menlo Park, Calif.
NASA's Astrobiology Program in Washington contributed funding for the research through its Exobiology and Evolutionary Biology program and the NASA Astrobiology Institute. NASA's Astrobiology Program supports research into the origin, evolution, distribution, and future of life on Earth.